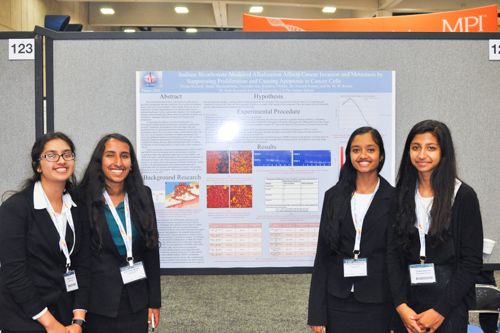 Last week, Harker sophomores Sneha Bhetanabhotla, Trisha Dwivedi, Neymika Jain and Kshithija Mulam traveled to San Diego to present their research project at the annual meeting of the Society of Toxicology. Their project, on alternative breast cancer treatments, was one of eight high school projects chosen from around the country. On March 24, the students presented it for the first time to toxicology professors and experts. That same day, the students met with researchers from Paris and toured the San Diego Convention Center. The following day, they were chosen to present at the poster session where toxicology experts were showing their research.